While the Rev. Cowell continues to serve both Grace and St. Paul’s Manhattan, the search begins in earnest for a suitable site for the church. The Building Committee included Horace Wood, James Jones, and Caleb John Jones. Caleb and Alice Jones, founding members, had three children; Lawn Jones Morris, Legh Jones and Bessie Jones). 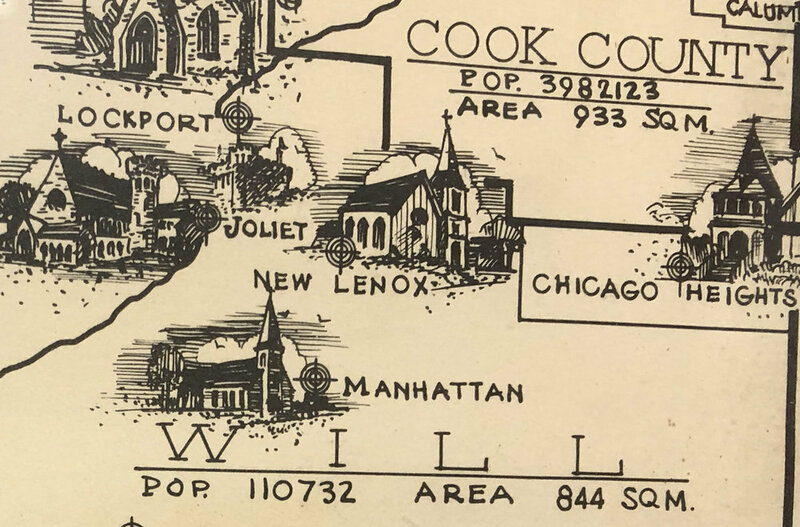 Late 19th Century Illustrated Map of the Diocese of Chicago, zoomed in on the area surrounding and including New Lenox. St. Paul’s Manhattan is visible to the south of Grace Church, although the church was closed in the 1960’s. Caleb Jones asked B.R. Phelps, Jr., for a copy of the “College Chapel” book (See Letter Images Below). He then requested that he make drawings to build Grace in a style similar to Christ Church in West Davenport, IA. Phelps made the drawings for $20.00. The Prairie Gothic style was designed by New York’s Richard Upjohn, a well-known architect. Two young residents, Thornton Haines and Ward Knickerbocker offered, free of charge, a lot north of Hickory Creek, southwest of Cedar Road. Materials had been delivered and excavation for the foundation completed when a very desirable location south of Route 30 was offered instead. On September 29th, 1869, this new lot was purchased from Austin Page at the northwest corner of Pine and Hickory Streets, in New Lenox, 160 feet by 160 feet, for $45. A second adjacent lot at this location would later be purchased from Austin Page in September of 1873 for another $45. “Opened for Devine Service” — First service held in the Grace Church Building. Windows were boarded, rough-hewn benches used for pews, and a box covered by a red cloth for an altar. The church was literally built around members as they worshipped. In a letter to Bishop Whitehouse, dated September 12, 1870, published in the Journal of Convention that year, the Rev. Cowell describes the service as “very glad,” and adds “It was a great day of jubilee; the day beautiful; the crowd unable to find entrance; Church people from Manhattan, Lockport, Joliet, New Lenox; the Joliet choir and choice music; three surplices in the Chancel; an eloquent, manly sermon, from Rev. Mr. Turner, upon the text, ‘The Lord is in his Holy Temple: let all the earth keep silence before him”; a large collection and a generous hospitality…. September 12, 1870. Excerpt from The Rev. 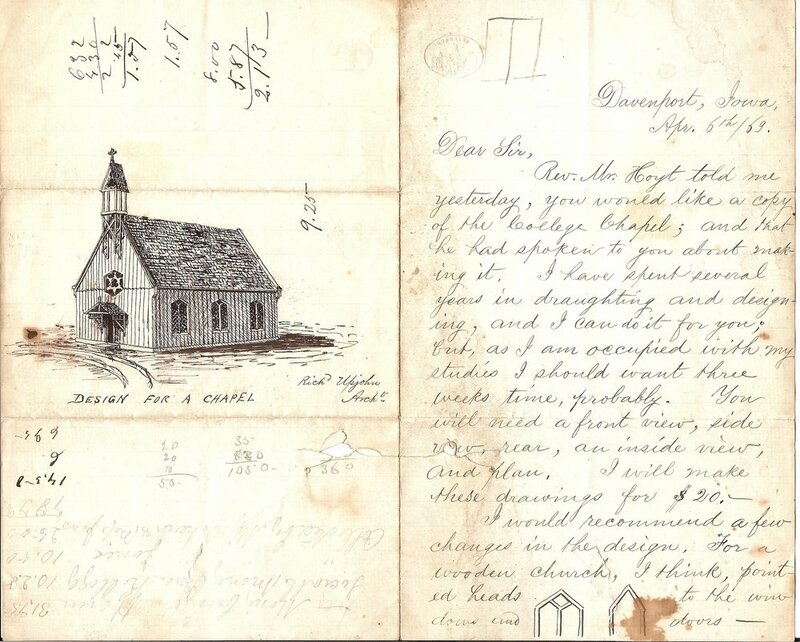 Sam Cowell’s letter to the Bishop of Illinois, John Whitehouse, attesting to the first service in the new Grace church building. The Journal of the Diocese of Illinois records that on this date, the Rev. Erastus DeWolf officially took charge of both the parish of Grace New Lenox, in connection with St. Paul’s Manhattan. Excerpt from the Diocese of Illinois’ Journals, 1871. The Rev. Erastus DeWolf presented the first confirmation class to Bishop Henry Whitehouse. The first person to be confirmed was Mrs. William Gougar, Sr. A brass cross placed on the altar in her memory was engraved: In Memoriam of Clarissa Anna Gougar 1839-1899. The Great Chicago Fire of October 8-10, 1871 was an event of such enduring fame not just because of the dramatic nature and enormous extent of the devastation, but also because of when and where it occurred. By the early 1870s, it was clear to Americans that the United States was being transformed into an urban industrial nation and that Chicago more than any other city seemed to embody that continuing transformation. The Rev. DeWolf presented a second class for confirmation. This was the last visit of Bishop Whitehouse to Grace, as he died young two years in later in 1874. A second lot (north) next to the church is purchased from Austin Page for $45. This would become home to the parsonage, later know as a rectory or vicarage. After that, the property became home to the parish hall.